Another post where I bemoan the fact that it’s been too long since I’ve written anything for this blog. But I thought I would spend the next few posts looking at the procedures of Parliament during the seventeenth century, and how they have influenced Parliamentary procedures today. This first post is about the roles of the House of Commons and the House of Lords in matters of spending and taxation. Some bills are so-called “money bills”, which deal solely with national taxes or loans. Some are “supply bills”, dealing with changes to taxation or public spending. In practice these two categories can overlap, but for Bills that fall into either category, the Commons will agree a “ways and means resolution”, which authorises any charges or taxes made on the public as a result of the Bill, and the payment of any sums into the Consolidated Fund (the Consolidated Fund is essentially the Government’s current account, managed by the Treasury). For most bills this will very likely not be the case, but it is a convenient fiction that allows the Commons to pretend its privilege has not been infringed. The Commons then removes the amendment from the Bill at Committee stage – the first point at which the bill can be amended – which means that in theory they are the first and only House to agree provisions that relate to public expenditure or taxation. In part the financial privilege of the Commons is enshrined in statute: section 1 of the Parliament Act 1911 provides that if a money bill having been agreed by the Commons is not passed by the Lords within a month, the bill receives Royal Assent regardless. In practice the Lords has never tried to amend a money bill, so this has not been put to the test. But the concept of financial privilege goes back a lot further than a hundred years. It has its origin in two resolutions made by the Commons in the 1670s. The House then proceeded to the Reading the Amendments and Clauses, sent from the Lords, to the Bill for an Imposition on foreign Commodities: Which were once read:And the first Amendments, sent from the Lords, being for changing the Proportion of the Impositions on white Sugars from One Peny per Pound, to Halfpeny half Farthing, was read the Second time; and debated.Resolution against Lords altering Tax Bills. Resolved, &c. Nemine contradicente, That, in all Aids given to the King, by the Commons, the Rate or Tax ought not to be altered by the Lords. Commons Journal, 13 April 1667. Mr. Solicitor General reports from the Committee to whom it was, amongst other things, referred, to prepare and draw up a State of the Rights of the Commons, in Granting of Money, a Vote agreed by the Committee: Which he read in his Place; and afterwards delivered the same in at the Clerk’s Table: Where the same was read; and, upon the Question, agreed; and is as followeth; viz. Resolved, &c. That all Aids and Supplies, and Aids to his Majesty in Parliament, are the sole Gift of the Commons: And all Bills for the Granting of any such Aids and Supplies ought to begin with the Commons: And that it is the undoubted and sole Right of the Commons, to direct, limit, and appoint, in such Bills, the Ends, Purposes, Considerations, Conditions, Limitations, and Qualifications of such Grants; which ought not to be changed, or altered by the House of Lords. Commons Journal, 3 July 1678. It’s worth noting that the two scenarios had very different outcomes. In the second, the Commons solved the problem of its privilege being infringed by incorporating the Lords amendments into a new Bill. In the first, the bill fell because neither House could agree it. Both issues came up during the process of what is nowadays known informally as “ping pong” – or in technical terms, as Lords Consideration of Commons’ amendments (where the bill has started in the Lords then moved to the Commons) and Commons consideration of Lords’ amendments (where the bill has started in the Commons then moved to the Lords). Amendments made in one House can be batted back and forth to the other House, until the point both Houses are content. Financial privilege can still cause issues at ping pong. There is a convention that if the same amendment is insisted upon twice by one House, and the other House rejects it, the entire bill falls. This is the case even if the disagreement is about a single clause. Financial privilege can be used by the Commons as a means of rejecting Lords amendments, although it’s also open to the Commons to waive their privilege if they choose to do so. Most recently, financial privilege caused issues for the passage of the Welfare Reform Act 2012. When the relevant bill passed from the Commons to the Lords, the Lords made over 100 amendments. These then passed to the Commons to consider in the first stage of ping pong. would alter the financial arrangements made by the Commons, and the Commons do not offer any further Reason, trusting that this Reason may be deemed sufficient. Commons Reasons and Amendment, January 2012. It is the convention that where the Commons disagrees with an amendment made by the Lords, and that amendment invokes financial privilege, that this is the reason given in response – even if it is not in fact the actual reason that the Commons has disagreed. It is the Commons – in practice, its clerks – which decides whether an amendment invokes financial privilege, not the Government. It is also the convention that the Lords will not insist on an amendment that is rejected for reasons of financial privilege: in other words, that they will not pursue “double insistence”, which results in the bill falling. But it is open to the Lords to send back a different amendment in lieu of the first, in the hope that the Commons will agree this instead. When the Welfare Reform Bill was returned from the Commons citing financial privilege as the reason for rejecting the 11 Lords amendments, it caused some controversy and suggestions that the Commons was defining financial privilege extremely widely, and that the Goverment was able as a result to use its majority in the Commons to impose the will of one House. The debate in the Lords on this matter on 14 February 2012 is worth reading in this respect. The Lords ended up suggesting variations on the amendments, some of which were Government suggestions but two of which were not – the latter dealing with the “bedroom tax” reducing housing benefit for claimants considered to have a spare room. The Commons then disagreed with these two further amendments when they were sent back to them by the Lords. The Lords in turn suggested another amendment in lieu, requiring the Government to review the provisions six months after implementation. The Commons accepted this, and the bill as a result was able to receive Royal Assent. “All aids and supplies, and aids to his Majesty in Parliament, are the sole gift of the Commons; and all bills for the granting of any such aids and supplies ought to begin with the Commons; and that it is the undoubted and sole right of the Commons to direct, limit and appoint in such bills the ends, purposes, considerations, limitations, and qualifications of such grants, which ought not to be changed or altered by the House of Lords”. Lord Morgan: My Lords, I will just say that I am afraid I do not agree with my noble friend Lord Tyler on this. Noble Lords: He is not your noble friend. Lord Morgan: Well, sometimes he is-but the view that we heard is historically flawed. The idea that there has been a seamless web since 1671 is quite unsound. As we know, the Parliament Act defined money Bills very precisely. It did so in the spirit of the resolutions of the 1670s. Distinctions were drawn between where the money came from, which was spelt out very clearly, the intended objective and the issues governing its expenditure. It was confirmed in 1911 by the great Prime Minister Mr Asquith that the money Bills provision applied to what he called “all matters of pure finance”. There was agreement across the House that it would not be applied to financial privilege more generally, particularly where issues of social policy were concerned. This is why very often House of Lords amendments had waivers in the House of Commons on many things-including, recently, university tuition fees, the savings gateway and child trust funds, all issues that I discussed myself. The principle that this should now be extended to any implications for public expenditure is far wider than the Parliament Act 1911, and adds a new and unwelcome principle to our unfortunately unwritten constitution. Incidentally the exchange at the start of this last extract is because Lord Morgan got his forms of address wrong. In the Lords peers refer to each other in the third person as “noble Lords”. Members of the same political party call each other “my noble friend”. Lord Tyler, whom Lord Morgan was addressing, is a Liberal Democrat and so not – at least in the context of the Lords chamber – a noble friend to Labour peers. 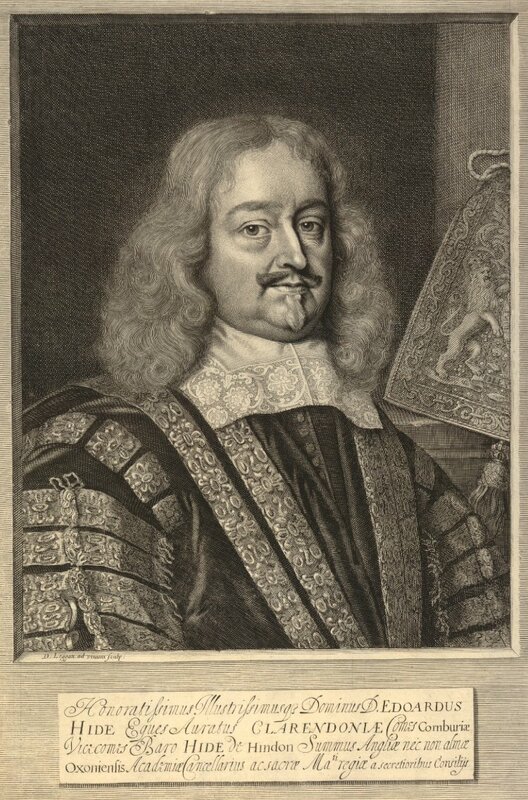 Today is the anniversary of the birth of Edward Hyde, first Earl of Clarendon: adviser to Charles I and Lord Chancellor under Charles II, and author of the History of the Rebellion and Civil Wars in England. There was one circumstance not to be forgotten in the march of the Citizens that day, when the shew by Water was little inferior to the other by Land, that the Pikemen had fasten’d to the tops of their pikes, and the rest in their hats or their bosoms, printed Papers of the Protestation which had been taken and enjoyned by the House of Commons the year before for the defence of the Privilege of Parliament; and many of them had the printed Votes of the King’s breaking their Privileges in his coming to the House, and demanding their Member. As a pamphleteer for the royalist cause, of course, Clarendon was closer than most the world of ‘paper bullets’ that he foregrounds in his account of the outbreak of the wars. Perhaps it’s this that means the History is still remarkably fresh for a modern reader, much closer in spirit to contemporary political diaries like those of Tony Benn or Alan Clark than to a drier work of political commentary. All of which means I thought I should break my rather long period of silence here to mark Clarendon’s anniversary. There are various free editions of the History on Google Books and the Internet Archive, as well as a modern selection of extracts edited by Paul Seaward. The best book about Clarendon’s own role in the English civil wars remains, 62 years on, Brian Wormald’s Clarendon: Politics, History and Religion. Wormald was a retired fellow at my college when I was an undergraduate: in retrospect I would rather my only encounter with him had been to talk to him about the book, rather than him catching me climbing over a wall taking a shortcut to the pub. The engraving of Clarendon is a print by David Loggan after Sir Peter Lely, from around the 1660s or 1670s: AN394659001, © the Trustees of the British Museum. First image is an engraving sold by the printsellers Robert Laurie and James Whittle of the Golden Buck at 53 Fleet Street in 1797, based on an earlier state dating back to c. 1750 or so. AN1082748001, © the Trustees of the British Museum. Second image taken by me on my way through to the Commons gift shop to finish my Christmas shopping. Some scattered thoughts about the section of the Leveson Inquiry report titled “A brief history of press freedom in the United Kingdom”. You can find this at part B2 of volume 1, starting at page 58. The chapter’s sub-title is “A brief history of press freedom in the United Kingdom”. Not “A brief history of the relationship between the press and the state in the United Kingdom”, or even “the newspaper industry and the state in England” (which is what the report is really about). Much of the legislation the report cites was targeted at all printed materials, and indeed before the early seventeenth century the concept of printed news or a printed news industry is a bit problematic. This is an important distinction, given the extent to which the various Licensing Acts of the seventeenth century are being referenced by media commentators arguing against statutory regulation. They are not particularly apt historical parallels with Leveson’s idea of a statutory backstop for the Press Complaints Commission. The report presumes that the pre-modern state was able, if it wished, to control or suppress the content and output of printed publications. While there are certainly examples of early modern states preventing publication, altering content, and taking books out of circulation once printed, there are many more of states failing to do so. And there are lots of examples, too, of authors falling into line with licensing when it suited them (not least John Milton, of whom more below). The story of press and state interaction is much messier than a simple narrative of bureaucratic, censoring governments seeking to crack down on radical libertarian journalists who might otherwise have let daylight in on the workings of government. The report doesn’t distinguish between political regulation of printed texts and mechanisms to regulate economic ownership and exploitation of the same texts. The 1538 proclamation by Henry VIII that the report cites was linked to the break with Rome and required those writing, printing or selling religious texts to have them examined by a representative of the king or the church. The report claims the proclamation was linked to the Stationers’ Company, but this wasn’t actually incorporated until 1557 – the point at which its charter began the procedure of stationers registering their rights to a text by entering their name and the book’s title in the Company’s Register. For the Stationers’ Company, cracking down on ‘rogue’ printers and booksellers was cementing it and its members’ economic position. Considerations of profit like this are largely missing from the report’s narrative, despite the fact that profit has, since the beginning of the English news industry been at the heart of the trade’s relations with the state. It’s interesting that the report focuses – like many broadsheet and tabloid editorials of the last few weeks – on John Milton as a crusader for press liberty. But Milton is much more complicated a historical figure than this. Despite writing Areopagitica in the 1640s he went on to play an important role in the Commonwealth’s system for licensing printed newsbooks during the 1650s. Milton’s life was full of so many ambiguities like this that he is actually a fairly apt metaphor for how complicated the relationship between press and state is. Of course the section in the Leveson report that deals with the news trade’s history is only a few pages out of hundreds, and so it has to simplify things by default. But it does make me wonder if, in creating black-and-white narratives about how modern problems have arisen, we are pushed – consciously or sub-consciously – towards black-and-white answers. The report’s bibliography doesn’t, as far as I can tell, cite any works by academic historians. Would the inquiry have benefited from calling historians as expert witnesses, or by setting out a longer, messier analysis of the development of the news trade? It has been far too long since I posted anything here: the last few months have been exceptionally busy, and once you get out of the rhythm of blogging it’s hard to get back into it. But I thought I should break my silence to link to Newton Key’s draft article on the early modern blogosphere, which you can find an open source peer review version of here. Newton has been blogging himself over at Early Modern England since 2007, so is well-placed to offer a critical analysis of how early modern blogging has developed over the last decade or so. His argument, which I have a lot of sympathy with, is that blogs about early modern history have lots in common with the ways in which people in the sixteenth and seventeenth centuries conceived of, produced, shared and engaged with knowledge and information. Whether it’s sharing the ideas of others with commentary, back and forth debate, creative reimagining of texts as they are shared, reused and reworked, or heated debates and flame wars, all of these have their equivalents in early modern print and manuscript cultures. How much of this is a product of the interests of early modern bloggers? As Newton notes, a lot of the early modern blogosphere is focused on English history; a lot of bloggers are from the UK and the US; and a lot are interested in book history (widely defined). It’s not surprising that at least some of us have gone into blogging with an eye to text, genre and medium-related parallels. I certainly started blogging with at least some sense of the similarities it had with authorship and publication in the early modern period. My choice of title for this blog was very deliberate, although in retrospect part of me wishes I’d picked Perfect Diurnall (if only because I think a lot of people got me and another blogger I’d rather not be mistaken for confused for a time). And there was a point after I finished my Masters where I wondered more explicitly about some of the parallels. Part of me, though, wonders whether the parallels that Newton identifies are more a product of certain characteristics inherent in both early modern and twenty-first century genres and media. We are used to thinking of blogging as a social medium (social media being one of those phrases that is so widely used that one can forget what it actually means). We’re probably less used, at least until recently, to thinking about pamphlets and letters as social media too: but early modern cultures of animadversion, annotation and text-sharing owe a fair amount to some of the inherent material and textual qualities of these media. Some of the parallels may be simply be a by-product of similarities between blogs and early modern media. I was particularly interested by Newton’s attempt to bring network analysis to the early modern blogosphere, which is (I think) the first time anyone has tried to do this. I’m not entirely convinced by the metric he uses – blogrolls, which at least some of us have gradually ceased to maintain in recent years – but it is noteworthy that certain key hubs do emerge within the network he maps. Sharon Howard’s blog is one obvious one, and indeed it’s thanks to Sharon that there was an early modern blogosphere at all, at least during the late 2000s (I was certainly inspired by her blog and I suspect others who started blogging around the same time as me were, too). One that doesn’t appear on Newton’s map, but I think deserves to be there, is Gavin Robinson’s site, which certainly between around 2007 to 2009 was the focus for a lot of really innovative experimentation with blogging as a form, and of lots of discussion in the comments. Going further back, Blogging the Renaissance was the focus early on of a small but lively community of posters and commenters. One further parallel that strikes me, which Newton does not raise in his article, is that the difficulties facing a scholar trying to analyse early modern blogs are not unlike those facing their counterpart trying to analyse early modern texts. Much of the writing, production and sale of early modern texts must have happened in ways that have not survived in the sources, in particular through spoken conversations. Many texts simply haven’t been preserved for us to read. And the anonymity of some writers, many printers and booksellers, and nearly all of those otherwise involved in the production and reception of texts, brings a similar challenge. These are problems that anyone writing the history of blogs also has to grapple with. It’s too easy to think of digital sources as somehow more permanent than material ones, but of course that’s not true: bloggers stop blogging, sites get closed down or pulled, and they aren’t always preserved at the Internet Archive or elsewhere. Anyone trying to reconstruct the controversy sparked by several posts and comments by Mercurius Rusticus, for example, now only has one side of the debate to analyse. None of Rusticus‘s own posts are now online, although some of the comments he (and I’m presuming it was a he) left on other blogs survive. And of course the lack of sources goes a lot deeper than that. Early modern bloggers are, I think, largely a virtual or imagined community, rather than a physical one (in the sense that I’ve met few other bloggers in real life – I think I can count four I’ve met, and two of them I knew as friends before they started blogging anyway). But like any community, its members communicate with each other in lots of different ways. There are e-mails, Twitter DMs, Facebook messages and so on sitting in inboxes and archive folders at the moment which would probably produce a rather different picture of the network between early modern blogs – not to mention conversations at conferences and in the pub. Already, despite the infancy of the early modern blogosphere, a lot is probably lost to those wanting to study it. But that’s not to say, as with any historical topic, we can’t try to recover what’s lost. Newton’s article is a good start, and it’s only appropriate – given his argument – that he’s put a draft version up for peer review via WordPress. So go and have a read, and annotate it in the style of a sixteenth-century scholar; or do what a seventeenth-century pamphleteer would have done, and leave an answer, rejoinder or animadversion here.